First and foremost, Pix™ is easier to see than a normal white golf ball. The human eye processes lighter colors more efficiently when it’s darker and darker colors when it’s lighter. It’s this phenomenon that led designers to the two-color design of TP5 Pix. Whereas most competitive products have only one color within a single image or shape, TP5 Pix’s unique design features 2 colors within one shape, further enhancing visibility and delivering a product that’s easy to see, regardless of the time of play during the day. Producing this shape requires a unique, one-of-a-kind printing machine which has taken more than 18 months to design and develop. In almost every sport utilizing a ball in play, the ball itself delivers immediate feedback – such as a baseball’s spin out of the pitcher’s hand. 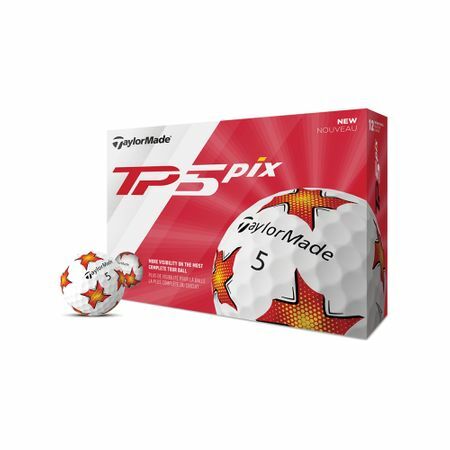 The larger contrast graphics of TP5 Pix allow golfers to see how much overall and side spin is generated around the green. Pix’s unique pattern with 12 evenly-spaced images allows the product to show spin when putting and chipping. The feedback the ball provides allows the golfer to immediately see the amount of spin being generated and the direction of that spin on shots on and around the green.